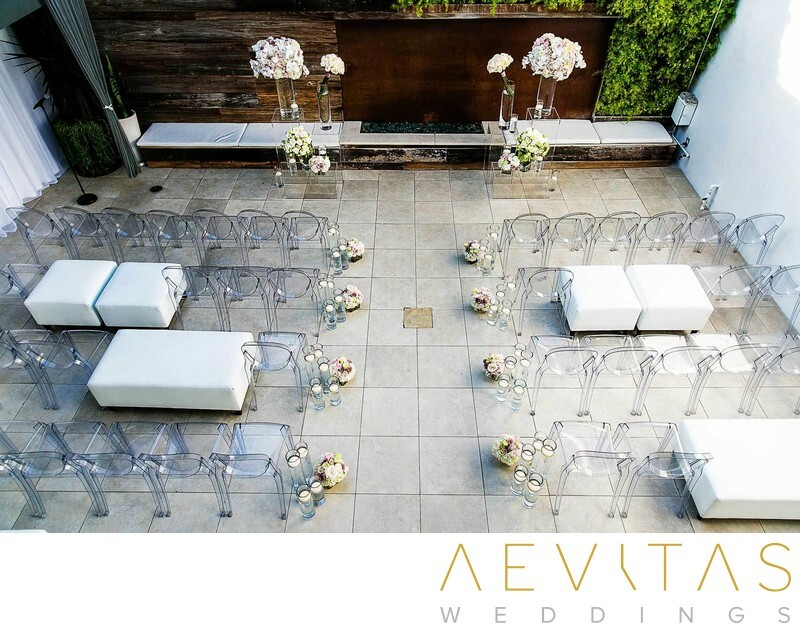 Hotel Seven4One provides a one-of-a-kind wedding experience in the trendy coastal suburb of Laguna Beach. Not only can you hold both your wedding and reception within its intimate courtyard, but you have exclusive use of the hotel and it’s rooms for you and your wedding guests over the entire weekend. The rustic facade of Hotel Seven4One hides a luxurious interior, with 10 guest rooms and 2 suites at your and your bridal party’s disposal. You can take in the Pacific Ocean views from its sun deck, or take a stroll down to the sands for a spectacular sunset. There are spacious suites for getting ready in for both the bride and groom, or your bridal party can prepare in their own rooms before coming together for a portrait session later. The suites feature elegant furnishings that provide a perfect backdrop for capturing candid images as you make your final preparations, as well as details shots of your bridal gown, shoes and accessories. You can hold a first look session in their interior courtyard or opt to wait until you walk down the aisle in this romantic open-air space. The exclusivity of Hotel Seven4One means that you can add your own decorations and unique style to the event, with their wedding coordinator and event staff at your service to create a wedding day that exceeds your dreams. After exchanging vows, your wedding guests will be invited to the second floor balcony for cocktail hour while the staff at Hotel Seven4One swiftly “flip” the space into an opulent reception venue. Romantic fairy lights adorn the interior courtyard, creating a magical and chic atmosphere while you wine and dine under the stars. Hotel Seven4One provides a personal chef who will create a customized menu to suit your individual tastes and demands. Their exceptional staff will be at your service throughout not only your wedding day, but your entire weekend stay, with everything from beverages to tableware taken care of. Weddings at Hotel Seven4One are perfect for couples wanting an intimate celebration with up to 100 of their closest family and friends that extends beyond the wedding day itself. This secluded two-story mansion is a dreamy setting for a laid-back wedding that goes at your own pace, without rushing between locations or maintaining other people’s schedules. Once your wedding day is over, there’s no need to bundle out, but take the time to kick-back with your bridal party and family and enjoy the spectacular Californian coast.